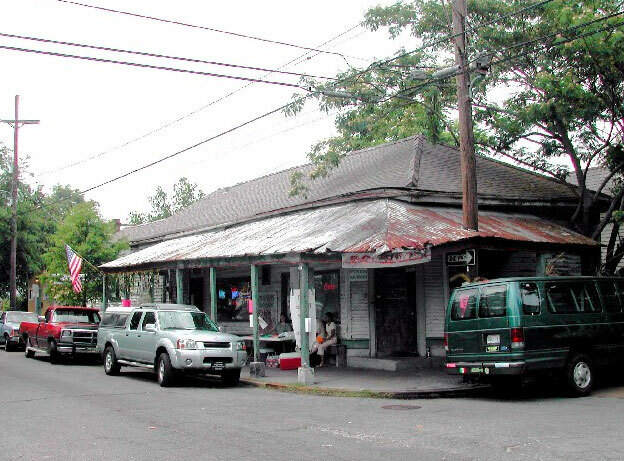 “Vaughan’s may be the best-known of Bywater’s many bars, thanks to the long-standing Thursday night gig by righteous trumpeter Kermit Ruffins and his Barbecue Swingers. A native son, Ruffins has recorded numerous albums (including the just-released Putamayo Presents: Kermit Ruffins) and toured the world. But he always comes home, and he always draws a crowd of fans, music students and occasional famous guests. A few, like jazz musician and composer Wynton Marsalis, come to sit in with the band; others, like actor Jude Law, Kate Husdson, Peter Jennings, Anderson Cooper, Mick Jagger, Steven Typer, etc., come to listen and soak in the sublimely ramshackle surroundings.